The building of the Ghunsa school and adjoining health clinic in 1990 was the start of the Kangchenjunga School Project. The school was built from locally-available stone and wood. It has nine class rooms and provides primary education for up to 40 students. A later project introduced pre-school education [more]. 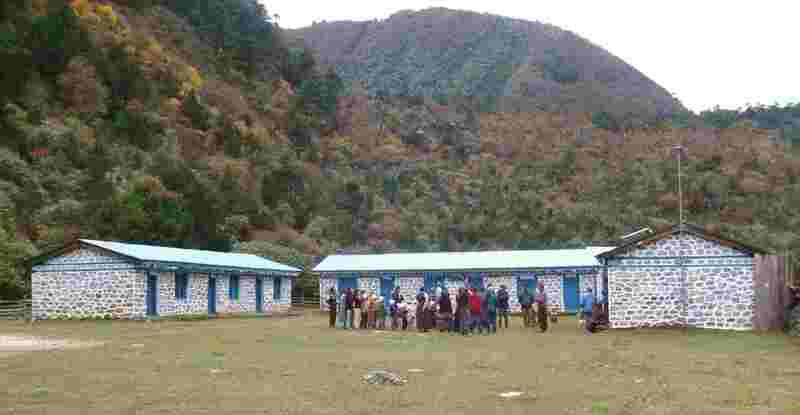 Cherie Bremer-Kamp raised funds for the school, coordinated its construction, then donated it to the Nepalese Government, which provides teachers. The clinic is a one-room construction adjoining the school. It is designed to meet the basic healthcare needs of the Ghunsa and surrounding community and has been most successful in meeting this objective. Cherie outfitted the clinic and recruited a local Buddhist monk, Pema Chembal, to be a "barefoot doctor". Chembal attends periodic training to enhance his diagnostic skills and knowledge of appropriate therapies and interventions. KSP pays Chembal�s salary and the clinic expenses of about $1500 per year. Aim: To provide education to the children of Ghunsa and healthcare to the Ghunsa area. Funding: Cherie�s lecture tour, the Chandler family and friends, Australian Geographic, American Himalaya Foundation.